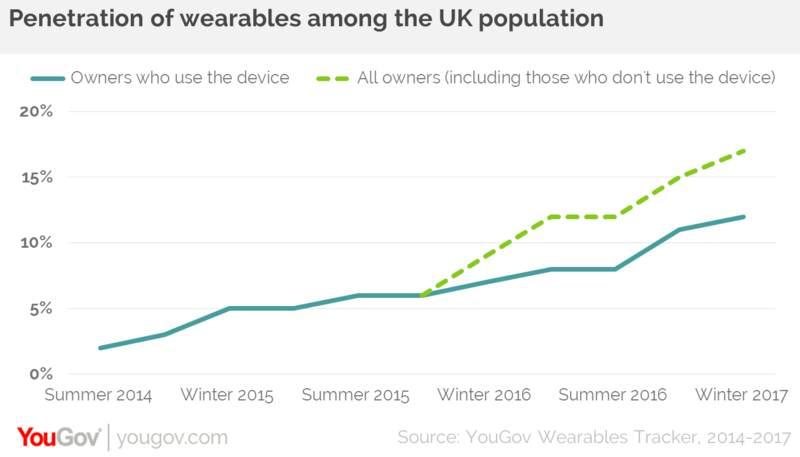 Since summer 2014, the number of people in the UK who own a wearable has risen from two to 17 per cent. Of these, 12% say they are active users of their device (almost six million adults). One in ten wearable owners own two or more devices, and more than three quarters (78%) of the total number of wearable owners say they expect to get another in the future – indicating that once a wearable is part of your life, it becomes indispensable. The even better news for technology companies is that the market is likely to grow even further. One in six (16%) of those who don’t currently own a wearable say they are in the market for one, which represents an additional six million people. Our research shows that fitness devices and smartwatches are almost equally sought after, with around the same number expecting their next purchase to be a fitness device (43%) or smartwatch (40%). However, despite a large number of people saying they would be interested in owning a wearable, future devices will need to innovate more and more to meet the demands of the public and capture greater market share. In the future, consumers want wearables to aid health by allowing people to monitor blood pressure (57%), detect calorie intake (46%), assess overall fitness levels (52%), and provide stress measurements (44%). Advances that help with powering the device – including wireless charging (50%) and kinetic power (39%) – would also entice consumers. As devices become better integrated with each other— much like how the digital camera and music player merged into the smartphone — they are also likely to further integrate into the internet of things, with apps and connected home devices working harder for consumers. It’s probable we will soon see wearables that open our front doors, integrate with virtual reality devices, and even order washing powder when we run low. Some organisations may even analyse wearable owners’ health data to offer cheaper insurance premiums. Amidst all of this, the challenge for brands is to make sure that they’re innovating in the right direction. Certain types of wearables – such as hearables and smartwear – are yet to make inroads into the mainstream market. This indicates that rather than innovating for the sake of it, brands should instead focus on developing features consumers say they actually want —such as more sophisticated health and fitness tracking. Learn more about YouGov’s digital, media, and technology research.